It’s no secret that many real estate professionals struggle with email. Here are 10 incredibly simple tips to help manage your inbox. Turn them off on your phone, your tablet and (if you’re actually crazy enough to have them on your computer) then turn them off there too. Allowing every email that arrives in your inbox to interrupt your day destroys your productivity. A case study conducted by the Danwood Group (Here) found it takes 1.5 minutes on average to read and recover from an email. If you get 50 or more emails a day, that’s over and hour of wasted time spent trying to refocus your attention. Worse yet, when your notifications go off during a meeting or a tour, you don’t look productive, you look distracted. Spam has largely been solved, but the new evil is bacn (pronounced “bacon”). It’s legitimate mail: newsletters, updates from sites, social media alerts, mailing lists etc. But it doesn’t deserve to interrupt your day. Like many professionals, I expect you receive your fair share of bacn. Some prefer to unsubscribe from these emails, but at the very least you need to process them in bulk. SaneBox’s software groups these messages into a separate folder and summarizes them in a digest. Not quite spam, but not worth being in your inbox? With SaneBlackhole, you’ll never hear from that sender again. One click, simple as that. Your time is precious, you have open houses to attend, clients to meet, contracts to write, sales to make and a plethora of other activities to complete. Write the key element of your emails in bold. This will signal actions you want the reader to make or information you want them to take away. This strategy significantly cuts down on miscommunication and wasted time with unnecessary back and forth emails with clients. If you’re like the rest of us, you’ve probably sent an ill-advised email you wish you could magically un-send. Turns out you can! If you use Gmail go under Labs and enable “Undo Send”. It will change your life. From now on you can have up to 30 seconds to change your mind about sending an email. Maybe you realized last second it’s going to the wrong client or maybe you simply forgot to update the time of an open house. Who says there are no second chances? If an email is not urgent or not actionable until later, most people tend to leave it in their Inbox. The problem is this causes you to look at it (i.e. spend time and focus thinking about it) every time you look in your Inbox. A much better way is to move it out of your Inbox. SaneBox has a great tool for this – email defer folders. Move an email into one of them, and the email will pop back in your Inbox tomorrow morning, next week or any other time you choose. This way you don’t have to worry about it until it becomes actionable. 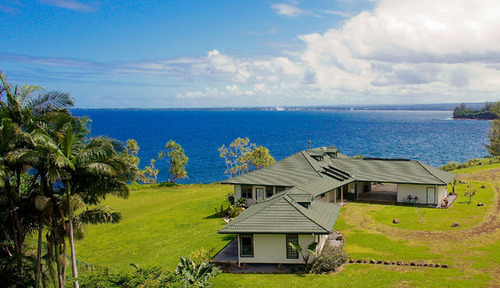 Let’s say you’re looking at a new property next month, you don’t need the email with the property’s address sitting in your inbox, defer the email until the day before you need it, so you’re prepped ahead of time. Have you ever sent an email to a new client that absolutely needs to be answered in the next few days? Let’s face it, people forget (accidentally or purposefully) and don’t always respond to your emails. If you need to hear back from someone, set up a system to remind yourself. Write it down on a special notepad or in an Excel document… that will, of course, be saved as something oh so memorable such as, “Monday.Jones.Ocean Drive.Remember Please.doc” Or if you live in the 21st century, just use the SaneReminders feature. When sending an email, add a specified time or date followed by @sanebox.com in the Cc or Bcc field. If you haven’t heard from the recipient by the time you specified you’ll receive a reminder. 7. How Long Is Too Long? Email threads are helpful in organizing communications between two or more people, but it’s important to remember they’re a double-edged sword. Organization can quickly turn into complete and utter chaos. To prevent emails from being lost and communication being blurred you can start a new thread simply by changing the subject line. As real estate professionals know, tons of vital information is stored in your inbox. Just forward your email to another account. If you somehow lose your main email (whether your provider goes down, or your account gets compromised), you’ll always have a copy of all your emails in another account. 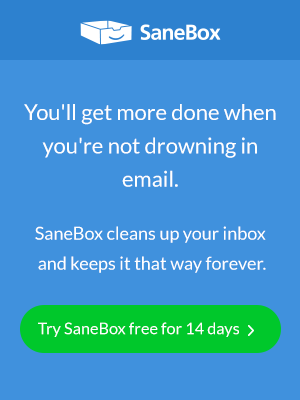 SaneBox is a California-based company dedicated to giving back the time a chaotic inbox takes away. With automatic email filtering, one-click unsubscribe, follow-up reminders, and much more, SaneBox makes the busy professional’s dream email solution a reality.